Good things come in small packages. That was the first sentence written in my newest Moleskine a couple of days ago in Fados Irish Pub in Easton, OH after completing business on a Friday afternoon. You see, I have been struggling to not only write in my Moleskine, but to actually carry it. I decided it was the carrying that was blocking the writing after I spied this new miniature edition at the Book Store across the street. It's ruffly a third of the size of my standard Moleskine. I call it my "Small Big Idea Book"! Under the guidance of a pint of Magic Hat #9, a thought enhancing elixir brewed in the mountains of Vermont, I broke through the barrier with lightning speed. I have to admit, being a bit of an obsessive-compulsive personality, I also found it difficult to just jot down ideas in my "main" Moleskine, preferring for that vehicle to be preserved as the next literary Nobel Prize winner. My Small Big Idea Book has freed me from my mental tethers to soar wherever I want to point my considerable beak towards. 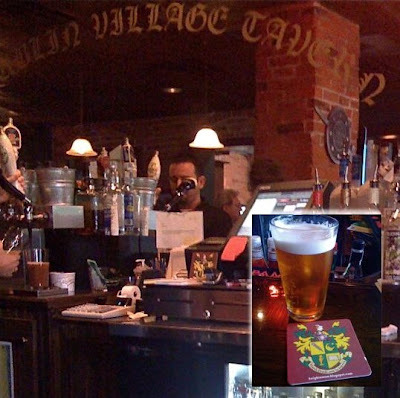 Of course that was a trip of 30 miles to Dublin, OH where I landed in my "McGrath's of Ohio", the Dublin Village Tavern. I celebrated my new found freedom with several pints of Boddington's, did some recruiting (as seen in the picture of our coasters behind the bar next to Sir Joseph of Dublin pouring a Guinness) and joining in the tavern camaraderie as we watched the debate between Obama and McGain while doing shots everytime McGain said, "My Friends" and Obama said, "Change". Sir Dayvd will be proud that not only did his crest creation take over the bar at DVT, but the English have once again taken over Dublin! This time not by force, but by a forceful personality. Of course that is my humble opinion. You can keep yours to yourself! Excellent report. I, too, found the small ones not too long ago; however, I've still to use with with anything other than some note-taking from current books I'm reading. I find them so easy to slip in and out of my breast or back pockets. They don't leave a bulge, and you almost forget you are carrying them. I combime it with a pencil stub for the same reasons..